It’s probably fair to say that you’re familiar with the obvious—and sometimes scary!—effects sugar can have on your child. And it’s probably also no overstatement that, as a concerned parent, you would rather handle your child’s ADHD naturally than resort to medication. Did you know that studies have actually shown the beneficial results a well-balanced diet can have on those dealing with ADHD? Yes, low-sugar, no-additives, and high-protein foods together with the right supplements can help control ADHD symptoms. How exactly can you put this ADHD-friendly diet in action for your child? Adjusting the type of foods your child eats can improve their concentration, decrease impulsivity and hyperactivity, and calm aggressive behavior. What do you need to change to achieve serious symptom relief? Decreasing the amount of sugar in your child’s diet is the first, and single most important, step to help prevent blood sugar spikes. Why? Eating high-sugar foods—which includes processed carbohydrates—quickly raises blood sugar levels. To drive the sugar down, your child’s body responds by producing insulin and other hormones, which often lower the sugar level too much. That, in turn, prompts their body to release stress hormones, which cause irritability and can make ADHD symptoms worse. So, steer clear of waffles, white bread, sugary cereals, and the like. And try keeping a balance on how much naturally sweet foods, such as fruits, your child consumes daily. Protein-rich foods—such as eggs, dairy, nuts, beans, lean meats, and fish—add to the low-sugar approach because they can help prevent surges in blood sugar. Moreover, they also help your child’s body to produce neurotransmitters, which aid cognitive functions and concentration. So, aim to include more beneficial protein in your child’s diet. For instance, instead of the aforementioned waffles or cereal, opt for a bowl of oatmeal, a glass of milk, and a piece of fruit. Combining high-protein, high-fiber, and fat with complex-carb foods leads to a more sustained and gradual release of sugar into the blood. Many studies indicate that hyperactivity in children with ADHD worsens when they regularly consume foods with artificial additives—such as artificial coloring and preservatives. How can you combat these chemical culprits? Read food ingredient labels carefully and avoid feeding your child foods full of these additives. Some of the most obvious offenders are candies, colorful cereals, soft drinks and fruit punches, and cheese puffs. Of course, fresh and unprocessed foods should be your firsts choices. However, when you get used to checking labels, you can also find a wide variety of other foods without artificial additives, including bread, cookies, juices, cereals, and even pizza. Iron – Sufficient intake of iron can improve ADHD symptoms almost as much as taking a stimulant. Too much iron, though, is dangerous. Therefore, talk with your child’s pediatrician first before using supplements. You can also increase iron through a diet that includes plenty of lean red meat, turkey, chicken, shellfish, and beans. Omega-3 Fish Oil – Omega-3 fatty acids are important for normal brain functioning. They can improve concentration, lessen impulsivity and hyperactivity in children with ADHD. However, unless your child eats lots of fish, they will need to take Omega-3 supplements. Liquid and capsules are best because chewables don’t contain enough of the fish oil to be effective. Magnesium and Zinc – Zinc regulates the neurotransmitter dopamine and can help improve the brain’s response to this chemical. Magnesium also is involved in the creation of neurotransmitters connected to concentration and attention. Plus, it has a calming effect on the brain. Keep in mind, though, that the effects of these supplements on ADHD symptoms are not as well documented as those of iron and fish oil. Herbs – Several herbs may be beneficial in managing ADHD symptoms. Ginkgo, St. John’s Wort, ginseng, valerian, lemon balm, rhodiola, and pycnogenol may all promote relaxation, improve sleep, hyperactivity, concentration, and reduce anxiety. Remember to talk to a professional to get reliable information and pure herbal supplements. Above all, keep in mind that supplements take time to fully work. So, don’t give up on the regimen too soon! Is the right diet a viable option to keep ADHD symptoms in check? Most certainly. As a parent, it takes control of your child’s ADHD to a practical and applicable level. So what are you waiting for? 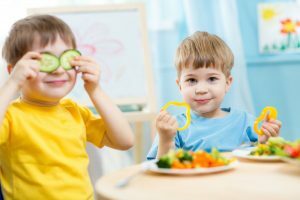 Get smart about nutrition and help your child live better!